This groundbreaking book holds the answer. Working with thousands of patients, Dr. Gundry has discovered that the “diseases of aging” we most fear are not simply a function of age; rather, they are a byproduct of the way we have lived over the decades. In The Longevity Paradox, he maps out a new approach to aging well-one that is based on supporting the health of the “oldest” parts of us: the microorganisms that live within our bodies. Our gut bugs-the bacteria that make up the microbiome-largely determine our health over the years. From diseases like cancer and Alzheimer's to common ailments like arthritis to our weight and the appearance of our skin, these bugs are in the driver's seat, controlling our quality of life as we age. The good news is, it's never too late to support these microbes and give them what they need to help them-and you-thrive. In The Longevity Paradox, Dr. Gundry outlines a nutrition and lifestyle plan to support gut health and live well for decades to come. A progressive take on the new science of aging, The Longevity Paradox offers an action plan to prevent and reverse disease as well as simple hacks to help anyone look and feel younger and more vital. Start reading The Longevity Paradox on your Kindle in under a minute. 5.0 out of 5 starsGundry is a great read. Fast delivery of great book. 5.0 out of 5 starsProvocative reading yet manageable approach for optimum health. I’ve just finished reading the book and wish I could express in words how much I appreciate the content. Just in case, the Longevity Paradox is indeed one of the most important pieces I’ve ever read—specially if we narrow down the options under the health category. Let me divide the review in 4 parts. First I’ll share personal thoughts and takeaways. Next, I hope to put together a summary from each chapter including favorite excerpts highlighted while reading the book. Then, I’ll include my opinion to whom I’d recommend reading it. Last, I’ll suggest a few complementary readings. I could feel the present book was carefully written—Dr. 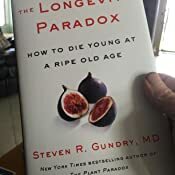 Gundry took the time and energy to translate the complex science of longevity into an engaging and practical book. Disregarding people with severe health conditions—in need of intensive treatment—I’d encourage us to take the time to change our habits gradually. It’s easy to underestimate the value of making small improvements on a daily basis. That said, it doesn’t matter where we’re right now. What matters is whether our habits are putting us on the path toward personal success. As a final digression, although there are precious books available independently of our health beliefs, preferences, and needs, I wouldn’t look further than the Longevity Paradox because it covers the latest research from different fields in a single piece. [Chapter 1] As we delve into the first chapter, Dr. Gundry clarifies that we share our health symptoms with those we share similar habits and live in similar environments, not so much because we share the same DNA. According to recent research studies, it’s our holobiomes—the sum of the microbes in our body, skin, and even in a cloud around us—and their genes that make us age so quickly, not our human genes. He then states that “you aren’t what you eat; you’re what your gut buddies digest.” In addition to digesting the food we eat, our gut buddies also manufacture and deliver vitamins, minerals, polyphenols, hormones, and proteins to where they’re needed in our body. That’s not all, they’re also involved with regulating our immune, nervous, and hormonal systems. He intelligently describes how our microbiome and mitochondria evolved over time in a synergetic role. Before we move on to the next chapter, we become aware of how modern days may be hurting our gut buddies. Simply put, we must avoid decimating our gut buddies while feeding the ‘bad bugs’. [Chapter 2] Here we take a close look at the gut wall, on how the quality of our single-layer mucosal cells is tightly linked to our overall health. When “your mucosal cells are lined up tightly side by side, your gut lining functions as a good fence that keeps everything except single molecules of digested amino acids, fatty acids, and sugar on the other side. But if your fence gets worn down and becomes rife with microscopic holes, it’ll allow other compounds to leak through, and your health will begin to suffer.” Dr. Gundry further explains that when the wrong molecules or even bacteria cross the border, the immune system ramp up, inciting a constant inflammatory attack. The presence of the lectin called wheat germ agglutinin, WGA, can be more detrimental than gluten because WGA is tiny and “even if the gut mucosal barrier hasn’t been compromised, WGA can pass through the walls of the intestine and cause inflammation.” Moreover, WGA has the ability to mimic insulin, creating problems in the body. Besides avoiding WGA present in wheat, hormesis can be a positive strategy to maintain our gut wall integrity. Hormesis “is the favorable response of an organism to low doses of stress that would be harmful in larger doses.” Through examples, he shows that in the Longevity Paradox program we’ll take advantage of hormesis because it plays an important role in activating longevity. Still in Chapter 2, the role of autophagy, stem cells, and seasonal eating patterns are comprehensively explained to show how they promote long term benefits. [Chapter 3] This chapter is one of my favorites. Dr. Gundry walks us through “the 7 deadly myths of aging” by debunking popular theories of longevity that may be actually causing us to age more quickly. One by one, each myth is properly addressed in the book:  The mediterranean diet promotes longevity;  Animal protein is essential for strength and longevity;  Growth hormones promote youthfulness and vitality;  High metabolic rate is a sign of good health;  It’s important to get plenty of iron as you age;  Saturated fat shouldn’t be demonized;  Milk does a body good. [Chapter 6] “From those seemingly innocuous senior moments to more serious neurological conditions such as Parkinson’s disease, dementia, and Alzheimer’s disease, all cognitive decline stems from the same root cause: neuroinflammation.” And let’s guess where does inflammation start? You guess it right, in the gut. According to the evidences, the gut and the brain are directed connected. That said, “gut microbe-driven neuroinflammation results in the collateral damage of neurons that your brain immune system is sworn to protect and causes the cognitive decline that we think of as a normal part of aging.” One of the highlights in this chapter is to understand that “leaving as big a gap as possible between your last meal of the day and your bedtime” plays a crucial role in preventing neurodegenerative diseases. The last section is a primer on the food sources we should consume on a daily basis to dramatically reduce our likelihood of developing neurodegenerative diseases. [Chapter 7] Following Dr. Gundry’s maxim, “you aren’t what you eat; you’re what your gut buddies digest”, this chapter focuses on keeping our microbiome fueled with the foods they love to prevent weight gain and skin damage. We’re encouraged to avoid endocrine disruptors to keep unnecessary weight gain away as we age. Among them, he discusses BPA, phthalates, sunscreen, arsenic, and azodicarbonamide. In terms of skin, “your gut is, in essence, your skin turned outside in.” As explained earlier in Chapter 1, there are trillions of bacteria living on our skin, and together with the microbiome, they make up our holobiome. To maximize the skin’s protection, it’s important to cultivate a diverse skin bacterial population. It’s fascinating to learn that “when it comes to sun exposure, your skin buddies can actually protect you against skin cancer despite your levels of exposure to the sun.” Not only that, but if our skin buddies leave for whatever reason, “you’ll see it right there in the mirror—in the form of thinning skin, age spots, wrinkles, acne, and eczema.” Dr. Gundry suggests 3 of the most beneficial ingredients, not for the skin itself but for all-important skin buddies: bonicel, polyphenols, and wild yam extract. [Chapter 8] From now on, we delve into the Longevity Paradox program itself, putting all the pieces together. One of the reasons why I genuinely appreciate this book is that Dr. Gundry walks us through the details, leaving virtually no margin for error. In Chapter 8 “we’ll cover exactly which foods your gut buddies love the most and which ones feed the bad guys.” One thing to take into account is that in a matter of weeks, if not days, we can dramatically shift the bacterial population in our gut by feeding our gut buddies properly. He goes through the details of each source, explaining the whys behind each decision. Among gut buddies’ friendly foods, let me share some favorites: leeks, cruciferous veggies, mushrooms, avocado, green bananas, berries, perilla seed oil, olive oil, coconut milk and yogurt, coffee fruit, and green tea. On the other hand, there’re “the main sources of nutrition for the bad bugs in your gut and should be avoided as much as possible.” Among them, simple sugars and starches, artificial sugar substitutes, conventional dairy products, corn oil, sunflower oil, and canola oil are all detrimental. [Chapter 9] This chapter is all about implementing the Longevity Paradox program through a coherent meal plan. Each month is broken down into 5 key components. Each one of the following components is explained in greater detail in the book:  We’re encouraged to eliminate animal protein and limit calories to 900 a day for 5 consecutive days a month to mimic the benefits of a whole month of full-time calorie restriction;  On most days we can eat as much as we like of the gut buddies’ favorite foods;  Once or twice a week we’ll skip dinner or eat it very early to make sure our brain is clean while we sleep;  Optionally, we can consume only 600 calories a day once or twice a week to get extra longevity benefits;  An intensive care cleanse program, which will give our mitochondrial function an extra boost, is an excellent strategy if we’re suffering from degenerative problems or want to kick-start the process. [Chapter 12] The final chapter offers 30+ recipes following the food lists and meal plans presented in earlier chapters. Although I’ve had the opportunity to try only 2 of them so far, I noticed the recipes seem to be even nicer than those in the Plant Paradox Cookbook. I enjoy preparing them at least once—following the details—to cultivate a sense of creativity when coming up with new dishes. Yesterday I cooked the 'Sweet Potato Gnocchi With Creamy Mushroom Sauce'. Well, although it took some extra time to prepare the dish, I can’t lie that the outcome was beyond my expectations. And just before start writing this review, I blended the 'Green Smoothie', which is basically composed by spinach, fresh mint sprigs, lemon juice, and avocado. I wish I could recommend the Longevity Paradox to all of us. As an example, it wouldn't be fair if I highly recommend the book to a close friend who has been on the Plant Paradox program for 6+ months and has also read a handful books on gut health and longevity. Having said that, both the content and the program are beautifully explained that can even take my friend by surprise. Besides this master piece, which is by now my favorite single book, there are others that have influenced my healthy habits for better. Among them, let me share 3 outstanding titles we can implement their recommendations in tandem with the Longevity Paradox. [How To Be Well, by Dr. Frank Lipman] A special piece where Dr. Lipman provides a holistic approach based on 6 pillars—or rings—that represent the spheres of life. Moving from the inner ring at the center outward, they are: how to eat, sleep, move, protect, unwind, and connect. We can decide which actions to explore because the book is “a manual of the essential skills that anyone can use to navigate safely and smoothly through the wild terrain of wellness today.” It’s literally a book to accompany on the journey of our life and become a dog-eared with use. 222 people found this helpful. I was so disappointed after reading this book--it's nothing but the same information from his previous book-- Plant Paradox with the exception of a few new 'studies' added. While I do appreciate his research, I do believe that the eating guidelines he emphasizes are sooooo restrictive--no meats, no dairy, no grains, very few fruits-- and by the way don't bother training for a marathon-- that you may live a long life but you may die stressing over all the things you can't eat and shouldn't do--so what's the purpose of living! I have given up a number of foods (nightshades, grains some fruits, some dairy), but his approach is if you don't follow 'all-the-guidelines' just invest in his supplements. At least with Dr Lipman and Dr Hyman's programs, I can still enjoy the art of eating and running without the fear!!! I read Gundry's book Plant Paradox this past February, just prior to my office visit with my functional and integrative medicine doctor. I asked her if she was familiar with the Plant Paradox book. Her reply was that she read it and considered it worthwhile for improving overall health. Gundry's second book Longevity Paradox follows in the path of his first book, this time focusing on gut health and how to achieve a healthier gut in pursuit of a longer and healthier life. I'm still reading the book, but can say that it offers much scientific information and useful advice to achieve on this subject. Both books are worth having in your personal health and medical library. 5.0 out of 5 starsThe key to a longer and better life! What a wonderful encore to Dr. Gundry’s The Plant Paradox! That book and the wisdom he expressed in it turned my life around. I have largely calmed my IBS, lost 40 pounds although I was not technically even “overweight”, and feel so much better now. [See my review under “Tom G” of The Plant Paradox.] Now I am on to 8:16 fasting and doing even better! Over the past two years I have avidly followed a wide range of Functional or Integrative Medicine (FM) leaders – amongst them Hyman, Wahls, Bredesen, Perlmutter, Cummins/Gerber, Fung, Wolfson, Brownstein, Cowan, Pizzorno, Tennant, Naiman, Seyfried, Christofferson, Patrick, Mercola, Amen, Lane, Myhill, Kalish, Asprey, Marchegiani, and many more. I have read their books and watched many if not most of their YouTube videos. Incidentally, all these authors’ books ought to be required reading in any medical school curriculum. Each of these FM gurus are superb. 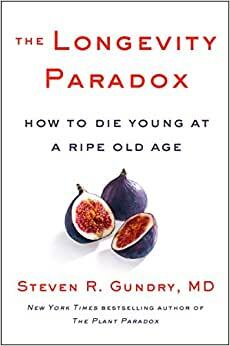 Because some of them come at FM from a particular background, no one has done a better job of painting the converging field of functional medicine than Dr. Gundry does in The Longevity Paradox. Gundry has captured the essence of quality nutrition and (self) health care in this informative easy-to-read book. It helps if you have read The Plant Paradox, but it is not necessary to have done so as most of the information in The Plant Paradox is summarized in The Longevity Paradox. There is much new in Gundry’s latest book, from the lessons he continues to learn in caring for his patients and in routinely testing their blood and other biomarkers every three months, to what he has gleaned from the latest scientific papers published throughout the world. He also includes a chapter on supplements and for inspiration throws in a listing of the 79 he currently takes. Yikes, I only take 22! Buy this book. Read and digest this book. Follow Dr. Gundry’s advice. You will not regret it! Neither will your microbiome. I have been following Dr Gundry’s Plant Paradox protocol for the past 2 years while researching health hacks to optimize my situation (Parkinson’s). Everything in this book agrees with or supports I’m experiencing and learning. I cannot be cured, but I believe my symptoms are minimized by following Dr Gundry’s suggestions. And I’m positive that many disease factors we describe as normal for the aged could be postponed or avoided. This work has helped me live a better life.